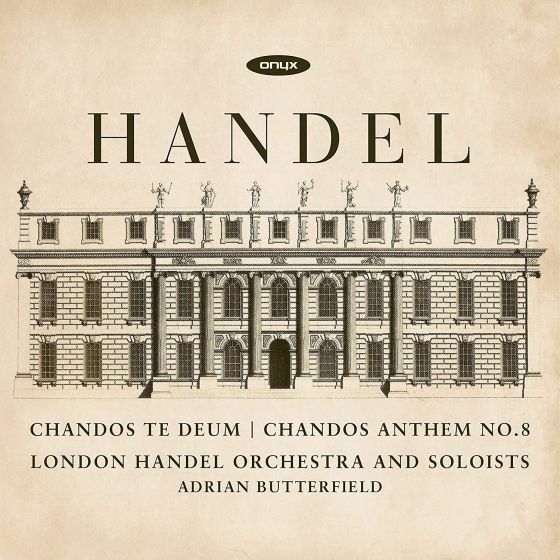 We are delighted to announce the launch of the CD – “Handel – Chandos Te Deum and Anthem No. 8” on the Onyx label, featuring Adrian Butterfield, our Associate Director, the London Handel Orchestra and a distinguished team of soloists. Many congratulations to Adrian on this amazing project. Our November blog is an interview with Adrian, exploring the background to the CD and what makes it unique. Can you tell us more about the Chandos Anthems? When did Handel write them and for what occasion? James Brydges had become a man of huge wealth as Paymaster General of the Armed Forces in the early years of the 18th century and he became a great patron of both the arts and the sciences. He invited Handel to his Cannons estate north west of London in 1717 and 1718 to provide anthems for services at the small church of St Lawrence, Little Stanmore which had just been beautifully rebuilt at great expense. The anthem texts are mostly taken from the Psalms. Brydges was unusual in England in employing his own ‘concert’, his personal collection of musicians, and Handel wrote these works specifically for them. We usually call these pieces Handel’s ‘Chandos’ works but Brydges didn’t actually become Duke until 1719, after Handel’s time there. You have recorded a CD of some of the works; what inspired you to do this? I have been conducting these Chandos works in St Lawrence’s Church for seven years now in conjunction with the London Handel Festival. It is always a very special feeling to spend time in a space in which we know Handel worked and to follow in his footsteps 300 years later and our audiences have been intrigued by the history of the place and to hear these rarely heard works performed in the venue for which they were written. I have also given talks and masterclasses at North London Collegiate School which stands on the site of Chandos’ Cannons mansion (which was pulled down soon after his death) and which holds some archives related to him and his family. In fact, I was first introduced to the life of the Duke of Chandos by my father-in-law who has been fascinated by him for many years! I have also been very fortunate to get to know the foremost scholar of Handel’s time at Cannons, Graydon Beeks. He particularly encouraged me to perform and record the ‘Chandos’ Te Deum as he has edited it for the Complete Handel Edition which is based in Halle in Germany, Handel’s birthplace. I am so grateful to him for answering my many questions and sharing so many of his research findings with me as well as writing the booklet notes for the recording. What is unique about the CD? Most of Handel’s choral works were written for choirs, some of them very large. His ‘Chandos’ works are usually performed in a similar way with several singers per part. However, it seems clear from the archives that he was writing for particular individuals and we even have some of their names such as ‘Mr. Blackley’ and ‘Mr. Row’. This helps to explain why the ranges of the vocal parts are so unusual. The Te Deum requires one soprano, three tenors and one bass, a very rare combination! This recording is unique in using just one voice per part with small instrumental forces to match. I’ve conducted these works in St Lawrence’s both with choirs and with one-per-part singers. The church is small and the musical establishment Handel was writing for was similarly compact. It has been so rewarding, though it should come as no surprise, to discover that performing these works in their original venue with forces very similar to those Handel used works perfectly. It reminds us what a practical musician Handel was! The Te Deum is hardly ever performed and has been recorded, I believe, only once before and yet it is a work of great beauty and imagination. The unique circumstances at Cannons have made these works more difficult to perform elsewhere which perhaps accounts for their sad neglect but we hope our recording brings it to a wider audience! You recorded it all at St Lawrence, Little Stanmore – why was that important, and how did it feel whilst you were recording? Performing and then recording in the venue for which these pieces were written has been a great privilege for me and my colleagues. We have tried to recreate the sort of sounds Handel and his fellow musicians might have been producing in that space 300 years ago and a recording from the church means that many more people around the world can feel part of that history. The area, which was out in the countryside in Handel’s day, is still remarkably quiet despite it having been swallowed up by London in recent decades so something of the atmosphere of the place remains and much of Canons Park is still there too. We very much hope that Handel and Brydges would have approved! Who is performing on the CD? We have a team of some of the best Handel singers and instrumentalists one could ask for with five remarkable soloists and principal players from the London Handel Orchestra. It is perhaps invidious to single out one person but Charles Daniels has been one of the top English tenors in this repertoire for many years now and he has been an inspiration to us all. More importantly, all five singers are not only internationally recognised soloists but are the sort of musicians who sing together as a choir just as the players work as a beautiful chamber ensemble. You’re performing works from the CD in November. Can you tell us more about that? We are concluding our programme on Saturday 24 November with the Te Deum which we recorded because we are releasing the CD of it at this concert. There will be some short talks as well as a performance by Alastair Ross on the church organ, some parts of which are as they were when Handel played on it. And we will open the concert with the beautiful Anthem No. 10, The Lord is my Light’. For further details about the CD, and to buy it, please click here. For further details about the concert on 24 November, and to buy tickets please click here.